So hopefully divorce is a long way away for you ... if you have to face it at all. 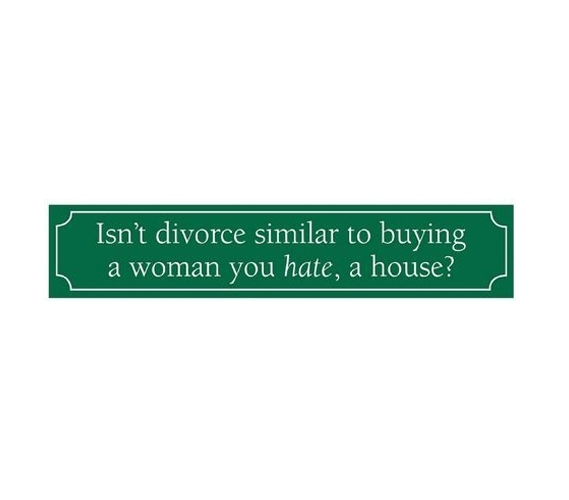 You're probably not thinking about marriage either, yet, at this point, but there's still reason to keep some good humor about it with this Divorce - Funny Tin Sign. Divorce itself isn't all too funny, but, heck, there are still some jokes you can make out of it. Funny tin signs for college dorms will bring a lighter air to your dorm, and first-time visitors will always enjoy chuckling at those college tin signs. Tin signs for dorms are also re-usable and re-positionable. Just take it down and mount it somewhere else, year after year. It's college wall decor that will be with you as long as you want!